As Qatar embarks on a unprecedented collection of infrastructure projects to prepare for the 2022 World Cup, fairplanet explores reports of the worsening conditions for those abused migrant workers who - treated like slaves - underpin Qatar's burgeoning development dream. The gleaming glass towers of Qatar's corporate skyline appropriately express the wealth and mundane luxury of one of the world's richest nations. With a per captia GDP hovering at around $100,000, Qatar's recent commitments to spend $100bn on infrastructure improvements ahead of the 2022 World Cup seem like a safe, if unconventional, bet for competition organisers Fifa. Yet a recent report from Human Rights Watch highlights widespread international concern regarding working conditions for Qatar’s hundreds of thousands of migrant workers, trapped in repressive and abusive working conditions and forced to live in abject poverty, and regarded as mere human-colateral in Qatar's breathless efforts to build 12 new sports stadiums, 70,000 extra hotel rooms, and a state-of-the-art network of rail and road links. “we cannot even return to our countries because we don’t have money. At home I have my mother, my wife, and two children to feed. It is a great pity that I cannot even look after my children”. Jayrav had not been paid for over three months, and in a country where the law prevents migrant workers from having any rights to collectively negotiate or form trade unions, Jayrav’s and his colleagues’ requests for fair treatment fall on the nonchalant ears of his employers. Many workers are lured to work in Qatar by recruiters who visit their home countries promising a higher salary, better life, and a means of sending funds back to their families in what are often difficult circumstances to begin with. However, when the workers arrive in Qatar, their passports are routinely taken away from them so that there is no escape from the unfair working conditions that await them, which include having to work for eighteen-months just to pay off the huge recruitment fees that are often trebled. As Jayrav’s story attests, even when the exploitatively inflated debt is finally serviced, there is still no guarantee of being paid at all. Just as a legacy of local regeneration was one of the principle aims behind the awarding of the 2012 Olympic Games to East London earlier this year, regional development and infrastructure sat at the heart of the Qatari bid for the 2022 World Cup. However, alongside the vast structural improvements that will transform both the social and economic conditions for Qatar's citizens, political and cultural imperatives also exist that are intended to permeate across the emirate regions as a whole. Not only will the Doha 2022 games consolidate a new commercial market for international football, but additionally they will provide a shared space for cultural exchange in which Qatar will open itself up to international discourses in relation to its record of political freedoms and human rights. There therefore exists an opportunity for the international sporting community, Fifa in particular, to scrutinise and pressure the Qatari authorities to improve the working conditions not only of its 200,000 citizens - who already enjoy a comparatively high standard of protections and wealth - but also for its 1.7 million migrant workers without whom the regeneration would be impossible, and whose story is easily left out of the official assessments of social progress. If this does not happen, then a World Cup tournament built on the deaths, enslavement and misery of migrant workers and their families, will be marked by the moral and political emptiness of its commercial purpose, and its further inculcation of gross inequalities in the community that it temporarily visits. 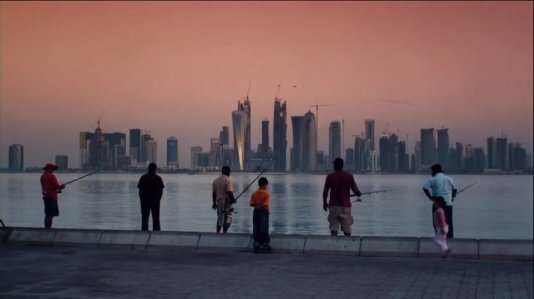 Images; both stills taken from the ITUCCSI youtube film 'The Hidden Faces of the Gulf Miracle'.